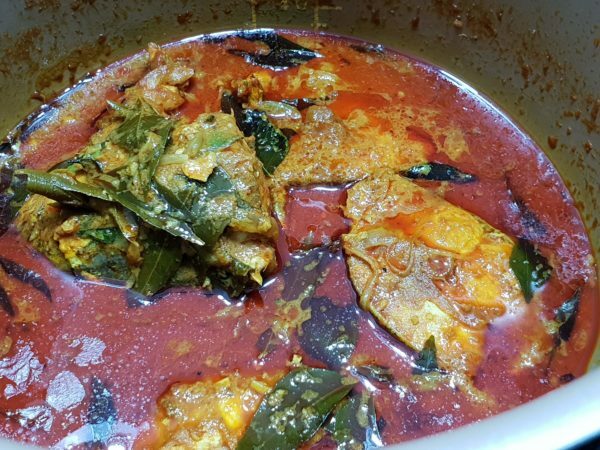 A very easy and fast to cook Curry Fish using frozen fish. The fish used has to be cleaned prior to freezing. 4 pcs Frozen Fish steak/portion e.g tuna, mackerel etc. Mixed the curry powder and the rempah into a paste. Add into the inner pot. Add in the fish and pour in the water just enough to 3/4 level of the fish. dd the curry leaves and seasonings. Give a little stir. Close the lid. Turn the VENT know to SEAL. Set mode to STEAM with KPT 5 minutes. Once the 5 minutes is up, slowly release the steam. Open the lid. Set to any BAKE mode or Saute mode. Stir in the tamarind paste. Taste and add seasoning if necessary. Toss in any preferred vegetables. Allow the vegetables to cook. The dish is ready to be served.